Madrid - Major European nations joined the United States on Monday in recognizing opposition leader Juan Guaido as Venezuela's legitimate head of state, while members of a separate regional bloc kept up the pressure on socialist President Nicolas Maduro. The coordinated recognition by a flood of European Union nations including Britain, Germany, France and Spain followed the expiration of an ultimatum for Maduro to call a new presidential election, aligning them with Washington and against Russia and China. "From today, we will spare no effort in helping all Venezuelans achieve freedom, prosperity and harmony," Spanish Prime Minister Pedro Sanchez said as he announced Madrid had recognized Guaido, the head of Venezuela's National Assembly who declared himself last month to be the oil-rich South American country's interim ruler. Eleven of the 14 members of the so-called Lima Group, including Argentina, Brazil and Canada, reiterated their support for Guaido as Venezuela's legitimate interim leader and called for free elections. In a statement following a meeting in Ottawa, they urged the international community to prevent Maduro's government from conducting financial and trade transactions abroad, having access to Venezuela's international assets and doing business in oil, gold and other assets. Mexico, a Lima Group member opposed to steps aimed at ousting Maduro, did not attend. Maduro's government, overseeing an economic collapse that has prompted 3 million Venezuelans to flee the country, lashed out at the EU nations, saying their move would affect relations with Caracas. In a statement, it accused them of submitting to a U.S. "strategy to overthrow the legitimate government" and singled out Spain for acting "cowardly." Among other EU nations recognizing Guaido were: Austria, Croatia, the Czech Republic, Denmark, Estonia, Finland, Latvia, Lithuania, Luxembourg, the Netherlands, Poland, Portugal and Sweden. The United States welcomed the EU nations' recognition of Guaido and encouraged other countries to follow suit, Secretary of State Mike Pompeo said in a statement. Italy, however, blocked a joint EU position to recognize Guaido, diplomatic sources said, with the government in Rome deeply divided over the issue. Norway, not an EU member, said it also was not recognizing him. The 35-year-old Guaido, accused by Maduro's government of staging a U.S.-directed coup, has galvanized Venezuela's opposition with a hopeful message. Guaido repeatedly has called on Venezuela's military, which has remained loyal to Maduro, to support a transition to democracy. "Soldiers, we continue to wait for you. The moment is now," Guaido said in a speech on Monday in Caracas, urging the military to allow humanitarian aid to reach people. Maduro is facing calls from a growing chorus of nations, including some of Venezuela's neighbors, to resign in the wake of last year's disputed presidential vote in which he won re-election. Critics have called that election a sham and the mainstream opposition boycotted it. He has defied European heads of state, calling them sycophants for following U.S. President Donald Trump. Most members of the Lima Group, which aims to peacefully resolve the Venezuela crisis, have said Maduro should quit in favor of Guaido and have called for new elections. The United States also wants Maduro gone, as do other key Western nations. Canadian Prime Minister Justin Trudeau said he would formally recognize Guaido's chosen envoy as Venezuela's legitimate representative in Canada in a move his government called symbolic. In New York, United Nations Secretary-General Antonio Guterres said U.N. officials will not participate in international initiatives on Venezuela in order to remain neutral. Maduro's critics have said incompetent policies and corruption have impoverished the once-wealthy nation, leaving it with widespread shortages of food and medicine and hyperinflation forecast to reach 10 million percent in 2019. 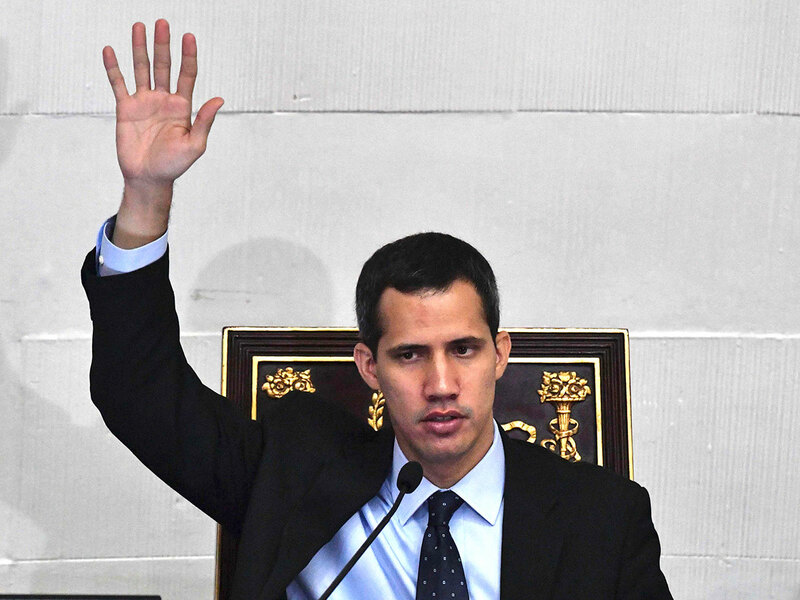 Guaido accused Maduro's government of trying to move up to $1.2 billion from the state development bank Bandes to a financial entity in Uruguay, but did not present evidence. Guaido urged Uruguay to prevent the move. Uruguay's central bank and the office of the country's president did not immediately respond to requests for comment. Maduro blames Washington and other Western nations for sabotaging Venezuela's economy, including through sanctions. The United States last week imposed sanctions on Venezuelan state-owned oil firm PDVSA. Trump, in an interview that aired on Sunday, said military intervention in Venezuela was "an option."